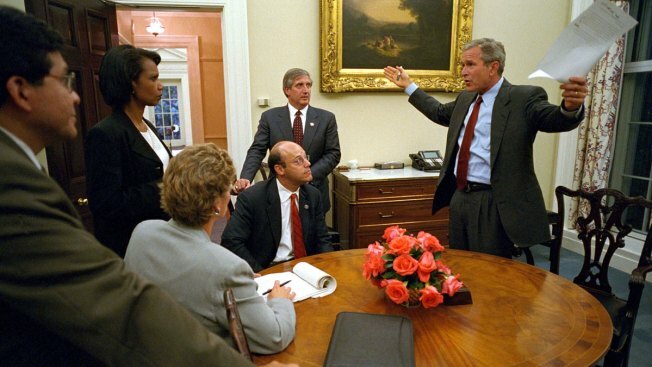 President George W. Bush speaks to his staff inside the private dinning room Sept. 11, 2001, at The White House prior to his address to the nation about the terrorist attacks on the U.S. With the president are (L to R) White House Counsel Al Gonzalez, National Security Adviser Condoleezza Rice, Presidential Counselor Karen Hughes, Press Secretary Ari Fleischer, and Chief of Staff Andy Card. Former White House Press Secretary Ari Fleischer used Twitter on Thursday morning to recall what the 9/11 terror attacks were like for President George W. Bush and the White House staff. Fleischer went into great detail about what he heard and saw 13 years ago while being with President Bush while at an elementary school in Florida as planes struck the twin towers in New York City and the Pentagon in Washington, D.C.